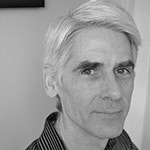 JIM DANIELS’ recent books include Having a Little Talk with Capital P Poetry, Carnegie Mellon University Press, All of the Above, Adastra Press, and Trigger Man, short fiction, Michigan State University Press, all published in 2011. Trigger Man won the Midwest Book Award for Short Story in 2012. Birth Marks, BOA Editions, will appear in 2013.